Are you a member of the CLUB? Die Fledermausketeers Club! We are currently working on a new site. In the meantime become a member. If code is used, this item will be canceled from your order and you will be sent a new payment email for this item. 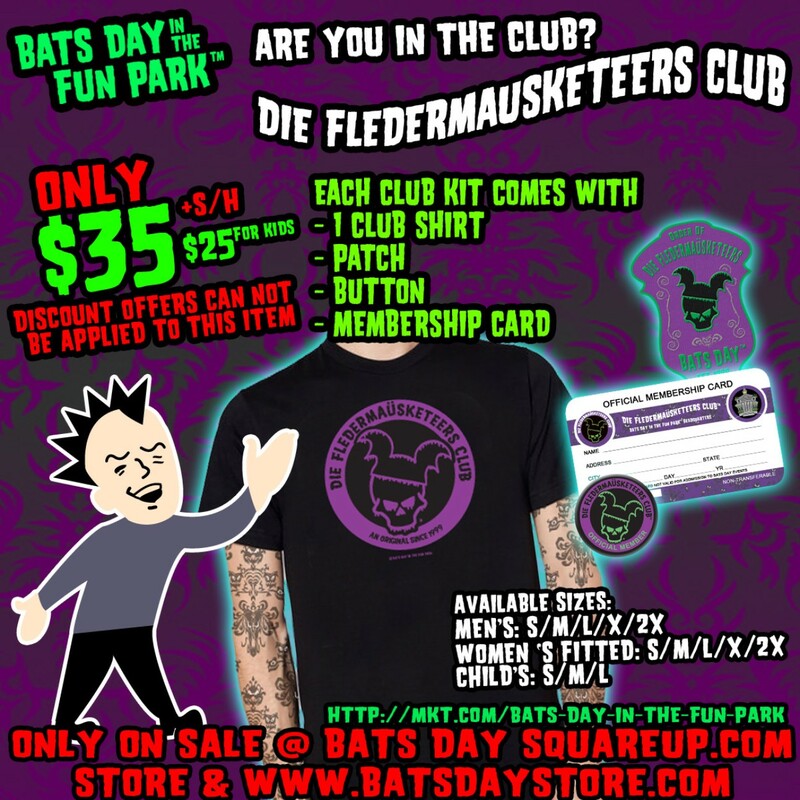 Now you can show off that you are one of Die Fledermausketeers Club members with you very own Die Fledermausketeers Club Kit. Be the envy of all of your FIENDS! Pre order your size before April 30 to ensure that you get the size you want. We will have some of these kits on hand at the 2014 Bats Day Black Market, but in very very limited supply and the price will increase to $30 base amount. If code is used, your order will be canceled and you will have to reorder. Pre-order before April 30, to ensure you can get the size you want. We will have some of these kits at the 2014 Bats Day Black Market but in very very limited supply and the price will increase to $30 base amount. This shirt will be printed after this sale as been completed and shipped when completed. To purchase this shirt you must go to our Squareup.com Market Place. Click Below. Unless it is stated here on this website, it is not affiliated with Bats Day in the Fun Park®. The names Bats Day in the Fun Park, BatzDay, Goth Day, Bats Day Happy Haunts Swinging Wake, Gallery999, Bats Day Dark Park, Die Fledermausketeers Club and Bats Day; The Bats Day logo, The Bats Day Dark Park logo, The Gallery999 Logo and all related characters and elements are the ™, ® and © of Bats Day in the Fun Park, LLC. Full copyright info can be found here. The Bats Day in the Fun Park events are not affiliated with the Walt Disney Company.